Welcome to the build from hell. There has been a lot of despair and confusion with the parts contained in this build and I will show you how to make it work. 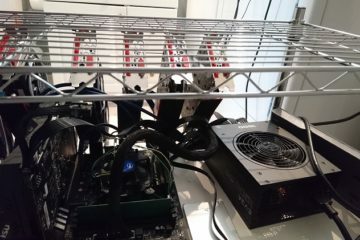 Lets talk expectations : This is a low-cost solution that is semi-portable, fits into a 15A dedicated socket and will be dual-mining Pascal and Ethereum. Let’s get to work ! The rig itself is a cheap rack from Walmart, all metal and easy to setup. It costs 26$ (all prices will be in CAD). I have inserted a piece of wood/shelving that somehow (the crypto gods have smiled upon thee) fit just perfect. Whatever you do, do not put any exposed components (motherboard…) directly on metal. I have also purchased a 3000+joules 6 foot cord surge protector from Newegg, for about 20$. The rest of the parts are straightforward. 8gb RAM DDR4 2133mhz, Pentium G4440 CPU socket 1151, 120GB Hynix SSD, 5 RX570 MSI Armor 4g and 1x RX570 ASUS STRIX 4g, EVGA 1000GQ PSU and of course the infamous MSI Z170A SLI motherboard. All these parts were chosen because they were on sale and at a good price, and two, because they work well for rigs (except the motherboard mind you). The reason I have chosen this cursed motherboard is because of non-availability of 6 GPU motherboards. This particular model was also on sale, plus a Mail in rebate and was too cheap to ignore. 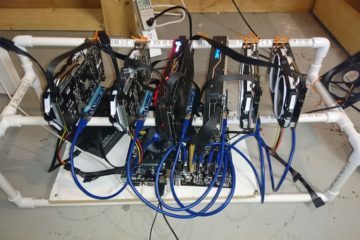 I can suggest doing a 5 GPU rig, it may be much easier to do. Now we assemble. First is the CPU, which is easily placed into the socket (do not assemble on the anti-static bag, because it is only anti-static INSIDE), then the stock CPU cooler, which is also very easily installed. Next install the RAM by pushing firmly down on it. I have sourced case screws and used them to prop up the motherboard so it leaves a gap under it to permit airflow, although that is optional. At this point set up your PSU and install all cables. Connect the motherboard main cable, and the CPU 8 pin cable. Then insert your first GPU in the x16 slot. Connect your SSD to the SATA port. You are now ready to plug in your screen, mouse and keyboard. Start it up ! Press del to enter the bios. You must enable WIN8/10 mode in the options, and set the PCI to GEN 1 (or gen 2). Set 4G decoding to disabled. Save and reboot, and install WIN 10. Once that is done enter the bios again and disable the WIN8/10 mode. We won’t be needing that anymore. Set Power ON after reboot/power outage. Install your remote monitoring software, Claymore dual miner, GPU-Z, MSI Afterburner, SRBPolaris V2.6, ATIWinFlash, DDU, ATIPixelPatcher, and download AMD drivers. In this particular case, you need to download an older version – such as 16.9.1 or 16.11.x, and a newer version, such as 17.4.4. Use DDU to reboot into safe mode. Select shutdown option. 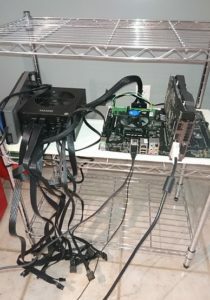 Install all your GPU’s and connect them with the USB risers. No more than 2 on a single cable. Don’t use the Molex adapter if you can. Start it up again. Open device manager, you should see all 6 GPU’s, with little yellow triangles. All is well so far. 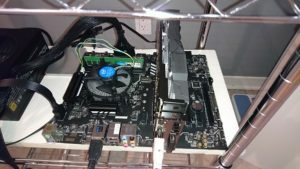 Now, thanks to atanas012 on bitcointalk (if i’m getting the source wrong someone please correct me), this is THE ONLY WAY I HAVE FOUND TO MAKE IT WORK on this mobo. Read it here. Open the older driver install file, and extract it. Once its extracted, close the installation window. DO NOT INSTALL IT. Then, do the same for the newer driver. DO NOT INSTALL IT. As atanas012 puts it: “Copy and replace all content from “C:\AMD\Non-WHQL-Win10-64Bit-Radeon-Software-Crimson-16.9.2-Sep21\Packages\Drivers\Display\WT6A_INF\B307117” to “C:\AMD\WHQL-Win7-64Bit-Radeon-Software-Crimson-ReLive-17.4.3-Apr17\Packages\Drivers\Display\W76A_INF\B313057” (Basically you copy the old driver over the new)“. Go in your device manager again and right-click on the first GPU with a yellow triangle. Select update drivers, and manually select the newer driver folder (in this case, the 17.4.4). It will install and tell you that all is well. Don’t forget to accept when it tells you its a weird driver. Reboot and enter BIOS. You must now enable 4G decoding. Save and reboot. Run the file and check your voltages, and power usage. Once that is done, close it. Run ATIPixelPatcher now. Open ATIWinFlash. Select your GPUs, and save a copy of the BIOS for each different GPU. Now in the ATIWinFlash, you can only see 3 GPU’s at a time. I suggest you use the command line, its better. Its Atiflash -p GPUnum filename.rom to flash. Check your GPU’s with atiflash -i. But first, open up SRBPolaris, and open your saved .rom files. Go into memory timings, and copy 1500 to above. If you feel like it, you can try other options, 1625 to above, or even input your own memory timings and test things out. I will keep it simple. Save to A DIFFERENT FILE NAME. Next, use atiflash to flash the bios to all your cards. Reboot. Claymore has released V9.3, ETH dual miner, which is mostly a stability update. Upgrade is quick and easy and helps with issues people had after V9.0 with -ASM options. Enjoy the wild BTC and ETH ride, I always recommend this website for a fun and quick way to check the price. Important update for Claymore dual miner, now v9.2. Main changes are added stability with dual mining, but most importantly Decred has changed to stake Version 3 – so changes must be made to the block header. In short, if you don’t upgrade, you’ll get 100% rejected shares. – improved mining speed stability. – added changes in DCR mining protocol. – fixed possible issue with rejected DCR shares on Nicehash pool. – added pool selection in runtime (“e” and “d” keys). – now if devfee mining fails for a long time, miner will not stop mining, it will turn on “-nofee” option temporarily with appropriate warnings, until successful devfee mining. – EthMan: added ReasonID parameter to .bat file which is executed when some rig has problems, check “sample.bat” for details. Claymore has just dropped another update for the dual ETH miner, now at v9.1. The speedup for DCR found in v9.0 has now been implemented for Pascal and SIA. Otherwise there aren’t really any major changes. A lot of people have asked me and reported that their hashrates fluctuate a lot with v9.0. Expect the same with the new version. But an easy way to fix this is to increase the -dcri value. You will eventually find a sweet spot where your ETH hashrate is stable. It might be lower, but at least it will be stable. In other news, Bitmaintech has released an updated version of the L3+ scrypt miner (availability may be spotty), which you can find on their chinese only webpage. Pandaminer has also updated their Pandaminer, now with Rx470’s apparently, and no longer using the MXM variant but the full size one. And stay tuned for the upcoming release of the RX5xx series from AMD. A few lucky people have test units that they can play with, but we will wait to see what the real production units produce. There might be a problem if they require the very latest drivers to run, and these may be more difficult for bios modding with the signature check. As per usual. Important update today ! Claymore has released his new V9.0 for the ETH dual miner. The main improvement is the ASM algorithm used for the second coin, in this case, DCR. We can only assume this optimization is coming for the others as well in future updates. You can expect DCR to improve by 40% to 75% in our experience, and on top of that, have an increase in ETH hashrate (very minor) as well. This is due to the “fine tuning” that you must do for each card type with +/-. Note that power consumption is also up, we see about 10-25w per Rx470/480 depending on settings. – added “-asm” option (AMD cards only) which enables assembler GPU kernels. In this mode some tuning is required even in ETH-only mode, use “-dcri” option or or “+/-” keys in runtime to set best speed. Currently only ETH-only and ETH-DCR modes are supported in assembler. Use “-asm 0” if you don’t want to use new assembler kernels. – improved ETH mining speed in ASM mode for some cards, also a bit reduced power usage for some cards (fine-tuning is required via “-dcri” or “+/-” keys in runtime). NOTE 1: if GPU throttles, best “-dcri” value is different. NOTE 2: speed peak can be rather short, so change “-dcri” value slowly. – dramatically increased DCR mining speed in assembler mode (up to 70%). Be careful, power usage is higher too. – fixed DCR Nicehash support. – added “FINE-TUNING” section to Readme file. – A lot of minor improvements and bug fixes. Small update from Claymore for the ETH miner, we now have some bug fixes and some minor new features. Nothing to get excited about though, as there aren’t any speed increases – although you may see a small increase due to the “minor improvements” that may improve the accepted share rate. – added Ethereum+Pascal mode for NVidia cards. – improved “-di detect” option: now after GPU order detection miner starts mining with the detected order. – now remote management is working in read-only mode by default. – improved “-mport” option, now you can specify network adapter IP for incoming connections for remote management. – fixed issue with “-retrydelay” option. – EthMan: added option for font color selection. 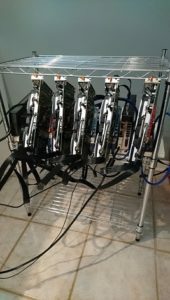 New Claymore dual miner version – Now with Pascal Coin ! The wait is over ! A new dual miner software version from Claymore is out. Now you can mine Pascal Coin and ETH at the same time ! See the details here. – added new coin for dual mode: PASCAL(PASC). Now you can mine Ethereum, Ethereum+Decred, Ethereum+Siacoin, Ethereum+Lbry or Ethereum+Pascal. NOTE: Currently Pascal is not available for NVidia cards. – added ability to use environment variables in “epools.txt”, “dpools.txt” and “config.txt” files. For example, define “WORKER” environment variable and use it as “%WORKER%” in config.txt. Now for the details. A RX470 will do 27mhs and 270mhs for pascal. And I have tested on a fury, which gets 30.5mhs and 600mhs. You are looking at about 25-30% increase in profit or more. BUT there is a big drawback…power consumption. You are looking at 30% increased power consumption too. At a minimum depending on your card. So watch out…I will not be putting this version on some of my rigs for one good reason. They are already optimized for the power they use, and this will push them over the PSU limits. Also prepare to have a great increase in heat…Happy mining ! edit: So adding Pascal to an RX470 puts 25 to 30w more power consumption at the wall. Quite a bit, but the profit is nice too. You can also mine Expanse or other ethash coin with Pascal on a 280x for example. That is profitable too. On R9 390s I see around 30-35w increase in power, which is a lot.